Dealing with Depression? The Three Seas provides effective depression treatment and counselling services for people who seeks help for depression, which is a serious medical illness. About 6% of Australians – or about one in 16 – experience depression each year. Over the course of their lives, almost half of Australians experience a mental health condition. Although depressive disorders may make you feel alone, you most assuredly are not. Worldwide, it’s the second-leading cause of disability, so it should come as no surprise that it exacts a heavy social toll. Current estimates suggest that mental health disorders cost the Australian economy $20 billion every year. This mental health condition convinces you that all is hopeless, that nothing can end your misery. The truth is that this condition is highly treatable, even curable. Though you may have to experiment with a few different treatment options before you arrive at a strategy that works for you, depression counselling at Three Seas can get you well on your way to recovery. It is a complex brain disease that affects its sufferers in different ways at different times. Though the classic presentation of this mental health disorder leaves its victims feeling sad and hopeless, some also experience intense anger and anxiety, and others may mistakenly believe that problems in their relationships or lives are at the root of the condition. This condition was not well understood until the 20th century, leaving untold numbers of people to suffer needlessly. Many ended up languishing in asylums, where dismal conditions and harsh treatment made symptoms even worse. Though we’ve made much progress, there’s still work to be done. Researchers are still working to uncover the various causes that contribute to this mental health condition, and it’s likely that we will eventually identify several distinct subtypes of the disorder. This mental health condition is a notoriously slippery disease to treat. What works for one person might make another feel worse. For instance, many sufferers have great luck on SSRI drugs, but others experience side effects that make things worse. Consequently, it’s of paramount importance to report the full continuum of symptoms to your provider, and to work collaboratively with him or her to arrive at the right treatment option. Because mental disorders manifest differently in different people, many mental health providers are increasingly treating the disease from a biopsychosocial perspective. This perspective recognises that treating a depressive person has many components. The biological side of dealing with a depressive person is the brain chemistry you so often hear about. Though changes in brain chemistry can cause this condition, depressive thoughts can also change brain chemistry, creating a vicious cycle in patients who do not seek treatment. The psychological side of dealing with a depressive person involves the thoughts and emotions that contribute to the severity of the disorder. Brain chemistry shifts can cause these thoughts, which lead their sufferers to feel hopeless and sad. But a steady stream of negative thoughts can also aid for feeling depressed, which means a variety of psychological mechanisms contribute to the disorder. The social side of this mental health condition is the way that it affects relationships. Many people withdraw from relationships when they become depressed, or even behave cruelly toward their partners making them progressively feel isolated. Likewise, problems in social relationships including divorce, breakups, social isolation, family conflict, or fights with friends. At Three Seas, we offer help for depression as an individual, working diligently to combat all three components of this mental disorder while listening carefully to your needs, goals, and values. It isn’t caused by a single factor that doctors are able to clearly identify. Some people have several risk factors and never get the disorder while others with no risk factors at all struggle severely. As research continues, we may uncover new causes of the disorder. Because this mental condition has biological, social, and psychological components, it’s likely caused by a complex cocktail of circumstances. Therefore unlikely we’ll ever uncover a single and specific cause. This condition of a person tends to run in families, and some research points to a genetic component of the disorder. This does not mean that this condition is caused by a single gene, though. Instead, research points to a complex interaction between genes and environment. A group of genes may predispose someone to develop the symptoms, but only in the right environment or at the right time. This means that, even if everyone in your family are depressed, you won’t necessarily get it if you take preventative measures. We all learn things from our family of origin. Your mother’s tendency to ruminate and your father’s angry outburst might feel normal to you, causing you to adopt these coping skills in adulthood. But the coping skills you learn from loved ones may not be healthy, and can sometimes depress the person. Likewise, children who are raised by depressed parents are more likely to be depressed themselves because of the ongoing stress and trauma associated with being exposed to someone else’s mental health condition. In fact, people caring for or living with depressed people are significantly more likely to experience this condition themselves. A history of trauma or abuse, particularly during childhood, greatly increases the risk of developing a depressive feeling. Trauma and abuse undermine self-esteem, destroy healthy coping mechanisms, and give their victims a painful memory that can be challenging to move beyond. Stress is a significant predictor of the mental health condition. Indeed, with sufficient stress levels, anyone can become depressed. When you’re under stress, your brain doesn’t work as well, and chronic anxiety can even alter brain chemistry. Unfortunately, the mental health condition can make stress even worse, creating a vicious cycle. Health challenges, particularly chronic and terminal illnesses, can be deeply challenging to live with. For some people, these challenges give rise to a depressive feeling while in other cases, the health issue itself is the cause. For instance, the symptoms of many brain disorders, as well as disorders of the endocrine system, may mimic this condition, so it’s of vital importance to rule out other causes first. Occasionally, the medications used to treat some health conditions can as well be the cause, so be sure to tell your medical provider about any and all drugs you take. People with poor social lives, those in abusive relationships, and those who feel isolated or rejected are significantly more likely to experience mental health disorder. Lesbian, gay, bisexual, and transgender youth are 400% more likely to kill themselves than their heterosexual peers, suggesting that social rejection plays a key role in affecting the mental condition of the person. Lifestyle issues, such as addiction, poor coping skills, or a career that makes you miserable, can all increase your vulnerability to feeling depressed. And when you develop this condition, your sense of hopelessness and futility is more likely to cause you to make choices that keep you depressed. For instance, you may be unable to get out of bed, causing you to lose your job or your friends. Ultimately, it doesn’t matter what caused the depressive feeling. Whether it’s a single cause, the culmination of a lifetime of challenging events, or you have no idea why you’re depressed, counselling really can make a difference. How Does Clinical Depression Affect Society? People suffering from this condition truly believe that they are worthless, that their lives don’t matter, and that things will never get better. They struggle to understand that this condition is treatable, so arguing with them is often a frustrating exercise in futility. Some people resign themselves to misery, telling themselves that no one cares anyway, so it doesn’t matter. The truth, though, is that the depressive feeling exerts exacts a hefty toll not only on its victims but also on those who love a depressed person. The loss in productivity, economic costs, and the decreasing in quality relationships extend well beyond the people who love a depressed person and into the larger community. The condition of feeling depressed is truly an international public health issue. Increased workload; many people who love a depressed person spend lots of time trying to help the loved one accomplish tasks or attempting to get him or her to pursue treatment. Depressive feeling; as half of people who live with a depressed person become depressed themselves. The end of the relationship. It’s common for caregivers to be victimised by verbal or even physical abuse. Some leave. And in some cases, the depressed person may mistakenly blame his or her loved one for the mental health condition, then end the relationship. If you love someone who is depressed, couples counselling can help, but you may also benefit from individual counselling to help you more effectively manage your everyday challenges for dealing with depression. For children who live with a depressed parent, the consequences are truly dire. Research has repeatedly proven that children of depressed parents are more vulnerable to becoming depressed themselves. These children are also more vulnerable to addiction and drug use, as well as dropping out of school, so prompt treatment for a depressed parent can make a world of difference for his or her children. This mental health disorder fundamentally alters the way your brain processes information, colouring your judgement and impeding your ability to make good decisions. For this reason, many sufferers are in denial about their condition. They mistakenly believe that their lives really are worthless, and their mental health condition is the product of challenging circumstances, or that if people just treated them better, the person would feel free. This is known as denial, and can cause people to delay treatment for weeks, months, or even years. The mental condition of a depressed patient tends to get worse with time, so delaying treatment only makes the journey to recovery harder when you do finally seek help. So how do you know if you are depressed? Most people with the disorder experience several of the following symptoms. Most – though not all – experience intense feelings of sadness that may manifest as sudden crying, the inability to think about anything other than what is wrong with your life, or a profound sense of grief. You may not know why you’re sad, or you may become depressed for a specific reason. In either case, feeling depressed is different from normal sadness because it doesn’t go away. Your sadness may temporarily lift when you do something you enjoy or something good happens, but it will quickly return. Depressed people often turn their feelings of sadness inward. They are plagued by feelings of guilt, shame, or worthlessness. These feelings often contribute to a sense of hopelessness. You may believe your life has no value, will never get better, that no one cares, or that you do not have the skills you need to get better. That’s the depressed state of your mind talking, not a reflection of your actual reality. Most people entertain thoughts of suicide, even if they don’t intend to actually follow through. You may fantasize about dying, or be tempted to kill or harm yourself. More than half of all people who kill themselves suffer from some sort of mental disorder. A few decades ago, few mental health professionals acknowledged the role anger plays in this health condition. Now all of that has changed. People may experience intense anger at themselves, others, or society. It’s especially common for men who are depressed to experience anger, and some may even lash out against intimate partners with angry diatribes or abusive treatment. Given that this condition cripples your ability to engage with the world, to think clearly, and to make good decisions, it’s wholly unsurprising that it can also cause relationship problems. Many people experience increased conflict in their romantic relationships, more difficulty getting along with friends, or increased problem behaviours from their children. This mental condition often leads to feelings of anxiety, and for some people, chronic anxiety is the underlying cause. For some people anxiety treatment can provide only temporary relief. Depressed feeling divides your attention between the task at hand and your intense emotional pain. Thus, it can inhibit your ability to concentrate and make good decisions. Some people with ADHD, a condition that inhibits attention, depresses the person as a result of their chronic attention challenges. It’s a myth that depressive feeling makes you unable to ever feel happiness, but it is difficult enjoying even the activities you once loved. You may not have the energy to pursue beloved hobbies, or you may no longer get excited about major life events. In some cases, this condition may even cause you to lose interest in your children, spouse, family, or other people you love. 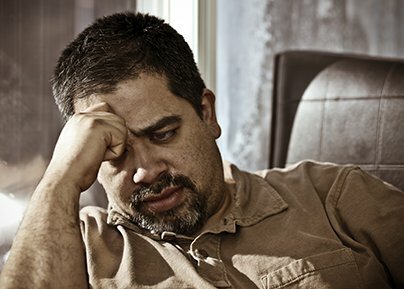 Most people with depressive thoughts experience lifestyle changes. They may lose interest in their jobs or family, struggle to get sufficient sleep, or sleep way more than they need to. Others experience changes in eating habits, unexplained aches and pains, or the sudden onset of physical health challenges. Medication is the first line of defence against a depressed person’s mental condition, it completely eliminates symptoms. More frequently, though, medication needs to be combined with other treatments. Research has repeatedly shown that medication works best when combined with therapy, so at Three Seas, we are big advocates of both therapy and medication. A number of medication options can work, and you may need to try several drugs before you find the one that works for you. Be sure to report any side effects you experience to your doctor since there may be an alternative that comes with fewer side effects than the drug you currently take. Depression therapy can help you explore the history behind your mental condition. Many depressed people aren’t sure why they feel so bad, but recognising the cause of your feelings is the first step toward eliminating them. In therapy, you’ll learn how to get rid of negative thoughts, control your feelings before they control you, and more effectively manage your relationships. Your therapist can also help you implement lifestyle remedies, and can work with you and your spouse or family to navigate family conflicts. Meditation, which can change the way your brain responds to stress and help you avoid automatic negative thoughts. Exercise, which some studies have shown can be as effective as popular antidepressants. Social support. If you want to get better, you need to be able to lean on people who love you. Reaching out to friends – or making new friends – can help you get on the road to recovery more quickly. Healthy eating. Some people insist that changing their diet changed their life. A regular sleep schedule. Getting up at the same time each day and going to bed at the same time each night can help you more effectively manage your symptoms. Developing a hobby. Sometimes forcing yourself to do the things you once loved enables you to get back on track. If you are a danger to yourself or to others, hospitalisation can help you get the treatment you need in a supportive environment. Three Seas offers referrals to qualified psychiatric hospitals and work with your hospital medical providers. A hospital stay isn’t a cure; rather, hospitalisation helps stabilise you so you can pursue treatment options such as therapy and medication. A generation ago, ECT was a potentially dangerous treatment that people often underwent against their willing. Today, ECT is safe and only done with your consent. ECT works by delivering a small shock to the brain. This shock induces a seizure that can help to rewire your brain, potentially eliminating the depressive thoughts. ECT carries some risks – including the loss of short-term memory – so is considered a treatment of last resort. For patients who don’t get better with other treatments, though, ECT can be a godsend. As many as 90% of patients see an improvement with this approach. You do not have to suffer in silence and isolation. Don’t believe the lies your mental health condition tells you about the hopelessness of treatment. Treatment can and does work, and Three Seas can be an excellent ally in your battle for wellness and happiness. You can get better, and Three Seas will show you the way through its hotline. It’s up to you to take the first courageous step, by reaching out and asking for help. You deserve it. Don’t suffer another day. Depression destroys lives, but counselling can cut to the heart of even the worst mental health condition.